As recruiters, we have a lot of opinions about how to be successful before, during, and after interviews in order to land a job. Our blog has a Career Consulting section that has tons of advice that may help you on your career quest. A recruiter is usually going to be the first person that reads your resume and has the initial interview with you – you’ve got to go through them to get to any next steps – so make sure you know how to make the best first impression possible. Interview requests may come over email (most likely for a first interview) or over the phone. Make sure you’re checking your email daily and responding to interview requests within one business day. A first interview is almost always over the phone. I’m always shocked when a candidate who has confirmed a time for an interview doesn’t answer their phone when I call – and for me, it’s usually a reason to disqualify the candidate (unless they return the call right away). It’s important to specifically say, “I’m excited to continue in the process/learn more about the position/be considered for this opportunity,” or something along those lines, at the end of an interview in order to make it clear that you want this position. Make sure your voice conveys that same excitement as well as your words. If you can find out something about the recruiter by checking out his/her LinkedIn profile or the company website, and reference something you’ve learned about them in order to make a personal connection, that can go a long way. It can also be as simple as asking how their day is going, remarking on the weather, or thanking them for their time. A recruiter might tell you how long it will take before they know about next steps in the process, and if they do, don’t follow up until AFTER that time frame has expired – usually it will be 1 – 2 weeks. If you follow up any sooner, it may be an inconvenience to them to have to respond and tell you the same time frame they already told you during your interview. If you, unfortunately, get a rejection letter after an interview, don’t respond to the recruiter with a snarky message. I’ve gotten messages that say, “good luck hiring the cheapest candidate,” and, “I wasn’t interested anyway.” You never know when that same recruiter has another opportunity that might be perfect for you, and you don’t want to ruin the relationship just because you’re disappointed you didn’t get a position. For recruiters, the joy of their job is in matching the right people to the right positions. If you’ve gotten a position that you’re absolutely loving, don’t forget to thank the recruiter and keep them in the loop. It makes our day when we hear that a candidate is satisfied with their new opportunity, and we can never hear it enough! 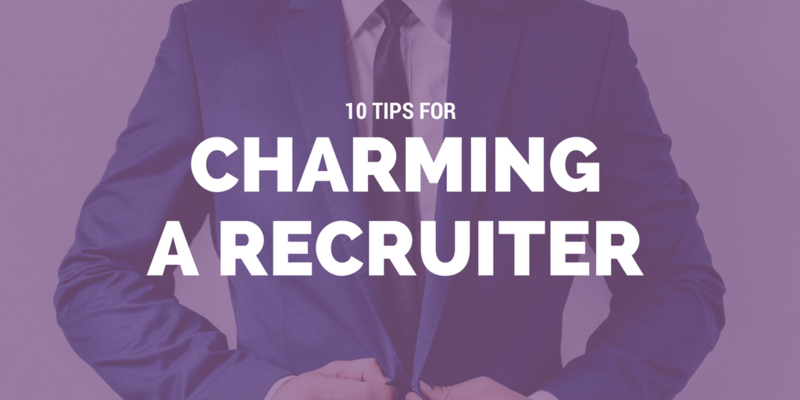 A recruiter is the first step to getting your foot in the door of a brand new position, turn on the charm and make it easy for them to pass you on to the next step in the hiring process. If you’re struggling with a job search, we’re happy to help provide some personalized career consulting services.